PuzzleMad: Possibly the Most Beautiful Puzzle in the World? Possibly the Most Beautiful Puzzle in the World? And of course, it's Mathematical Too! I am forcing myself out of my deathbed to bring you a quick blog post today - this summer cold is proving really bad and even after being forced to take a couple of days off work I am still not much better. In true male fashion, I am not complaining much and just being very brave and soldiering on. Unfortunately, I have infected the current wife with what I thought had originated with her in Scotland. But, judging from the effect it has had the last few days, must have been picked up here and seems to have mutated into "She-bola". Now I am sure you will be shocked to hear that she has been muttering vile things about what she plans on inflicting upon my person should she survive. I suspect that a Whack! Ouch! will be very mild compared to what she has in mind! Gulp! As you ALL know, I am not generally a puzzle box collector (despite what Allard's latest post says about me). 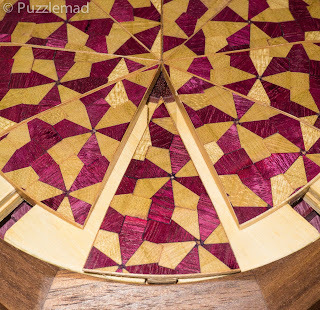 Some of my puzzles do have cavities in them but to me, that is an incidental feature! 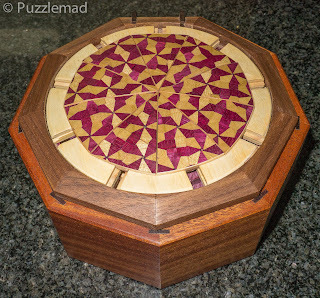 I love good puzzles and if they are beautiful then that adds to the attraction for me. 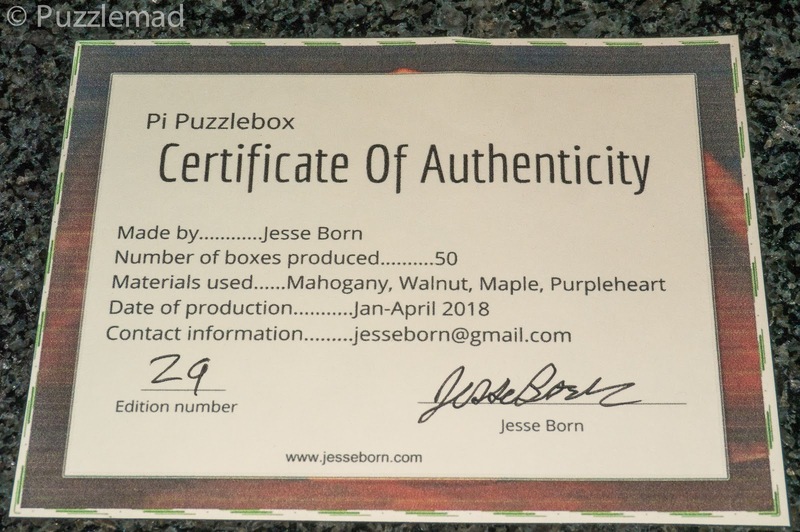 I have been watching Jesse Born on Facebook for a while and was very excited when he showed off something new (I had enjoyed his entry into the IPP design competition last year but had been unable to solve it). It looked to me to be a fairly classical box and hence was not something I was particularly going to buy. This one, however, whilst being a box, was simply gorgeous and I therefore had to make an enquiry about purchasing it. Jesse is great to communicate with and a month or so after my enquiry a rather large cardboard box flew across the Atlantic to Sheffield. After the usual tussle with Her Majesty's revenue and customs department and a moderate bribe was paid, it landed here. 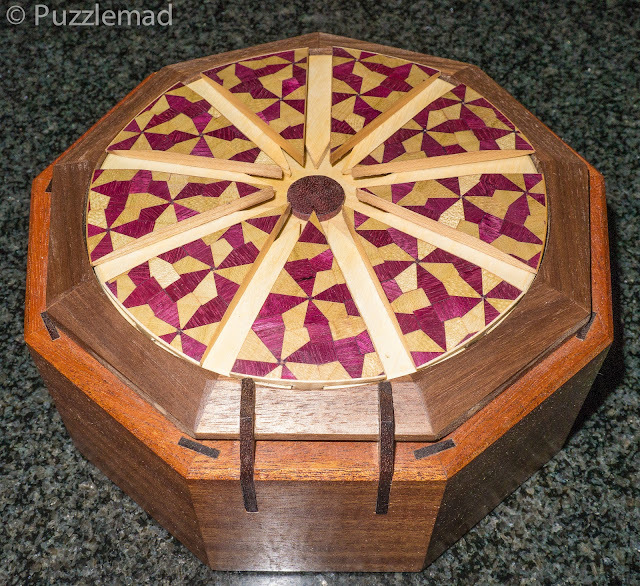 Every detail about this puzzle is stunning - the choice of woods, the detailing on the slipfeathers, the unusual nonagonal shape, the design of the hinge (at least I assumed that it was a hinge at that stage) and of course, the Yosegi design on the lid. Even Mrs S admired the beauty of it before commenting on the rather large dimensions! Luckily I was able to reassure her that it was destined to go on display in the second puzzle cave upstairs. The slices of the pie appear to slide towards the centre (at first quite a lot of them could slide) and at that point, that seemed to be the only thing that was possible. It was time to be systematic and see whether certain slices would allow other things to happen. I was not disappointed! I continued fiddling and realised quite quickly that if I got the right moves then progression was easy to achieve. About 3 weeks into my intermittent playing I realised that there was a definite mathematical pattern to the puzzle which I was able to confirm by racing through almost all the moves towards the end. I could not believe how Jesse had managed such an amazing sequence of moves. Then....I hit a brick wall. What I thought was the final move would not seem to happen. Was I completely wrong? Had I incorrectly gone down all these moves to be stumped so close to the end? I assumed that I was wrong and started again but the clue in the name of the box kept haunting me...I could not be wrong! One last slice of pie and it won't move! At last! Even the interior is gorgeous! What was the problem? Nothing really that was down to Jesse's workmanship. The weather here has been VERY hot and pretty humid for the last 4-6 weeks and the simple sliding bolt latch that the final pie piece pushed was very very tight. Having used my external tool to open it I was able to gently move it back and forth a few dozen times and now it works very smoothly. I have opened and closed the box a number of times since and it works perfectly now. I am sure that in the winter it will be very smooth. 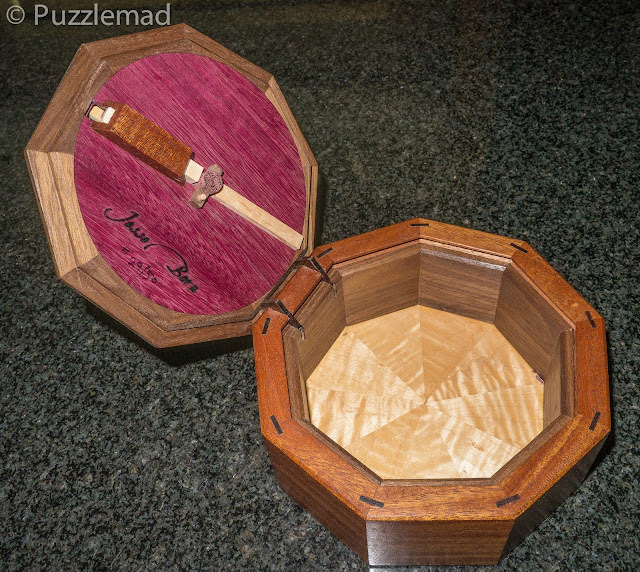 Amazingly Jesse has made it possible to see the mechanism of the box. A pin can be pulled and the lid can be taken apart. The physical representation of a mathematical idea looks very abstract when separated into pieces but after a fair bit of play and some doodles, I was able to visualise how it works. 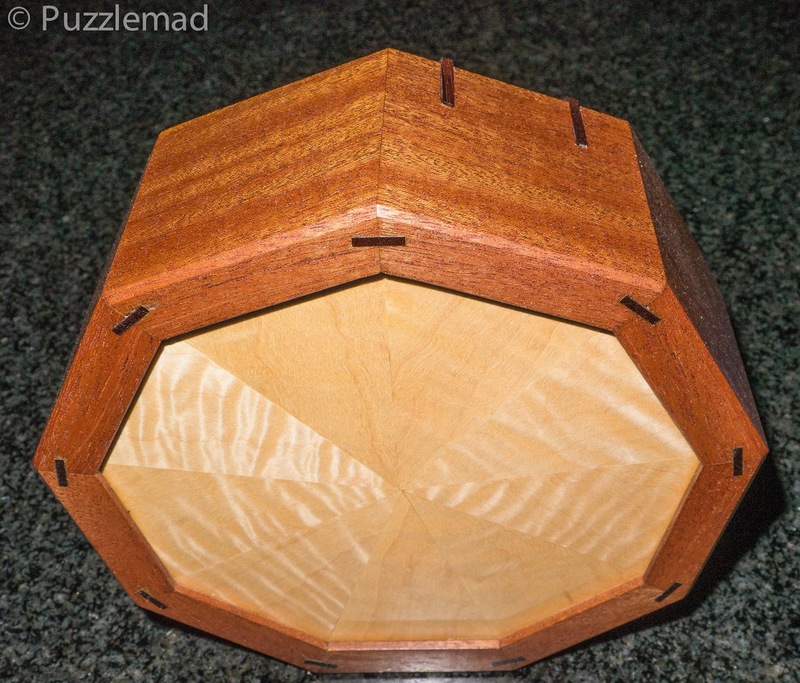 This new puzzle designer is a genius. I know that Allard enjoyed his work as did the perpetually puzzled and inebriated surgeon, Steve. Jesse has another design in the making just now and I cannot wait to see it. If you are interested then express your interest on his signup page here. This Unicorn is Real and I'm Not Crazy!